Cherry Hill Roulade | Bake This Cake! 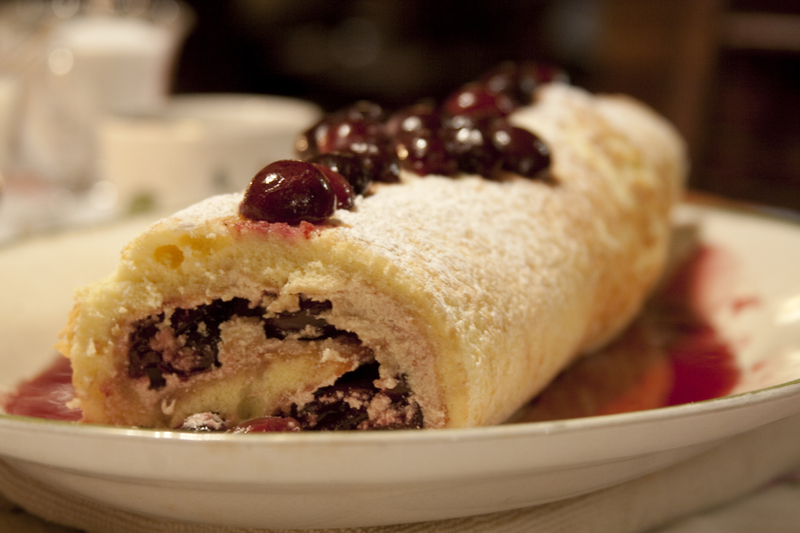 Elegant Cherry Hill Roulade. A vintage rolled cake made modern! Country jam is replaced with sweet-poached dark cherries layered on Cherry French Buttercream Meringue. The rolled cake is lightly dusted with confectioners sugar and each slice is served with gently brandied cherries and a dollop of Cherry Creme Chantilly. A drizzle of homemade cherry syrup adds the final loving touch! whoo hoo! Road Trip to the River House: We’re on the road. Highway 99, to be exact. Heading out of the city straight north through the heart of the state on California’s big “Main Street”.We’ll be sliding through Bakersfield (think: hot rods and the cool Vans Skatepark), Tulare (#1 or 2 in U.S. agriculture and home of the World Ag Expo), then Visalia (known as the gateway to Sequoia Natl Park). On to Fresno (home of an awesome zoo and the Island Waterpark) and then to Madera (with their opposite spectrums: Madera Motocross Park and Madera Wine Trail). Food Destination: We’ll be gathering at the family fishing lodge. We call it The River House because it sits on the banks of the Merced River. It’s located about 4 hours north of L.A. just outside of our home town of Merced (another gateway…the gateway to Yosemite and home to the new UC Merced campus). Snellingis a sleepy little country town just perfect for family time, barbecues and strolls through the rolling foothills.Normally, this time of year, we’d have packed our river shoes and oars in preparation for a good long canoe ride. But certain times of the year, the snowmelt in Yosemite makes the river treacherous enough to threaten lives…so one foot in the river might just get you arrested by the local Sheriff. As we travel north, we’re also on the look-out for a big sack of fresh-picked dark cherries for our special River House dessert. Road Stop: Oh. And we must stop near Kingsburg at Bravo Farms. This is an interesting road stop for fresh nuts and produce. 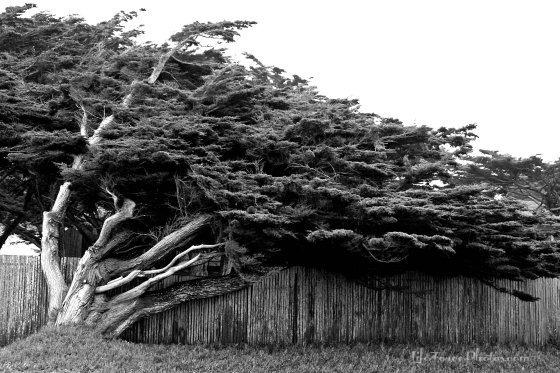 But, there is an overriding reason we never pass this way without stopping. It’s the home of the Date Shake! 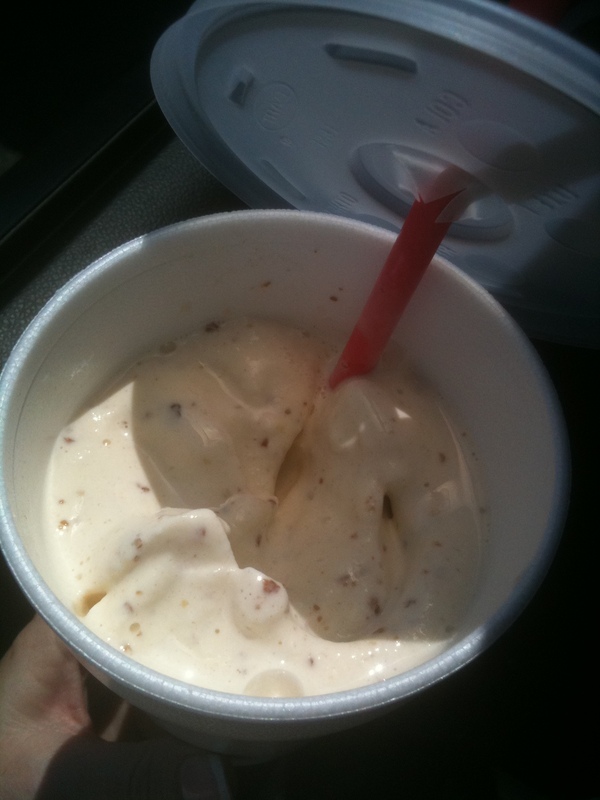 Bravo Farms’ famous Date Shake!This is where you’ll likely wait in line behind travelers who have stopped many times over the decades for the same heavenly (if unlikely) sweet treat. Arrival: It’s not long before we find ourselves rolling up to the house. Stepping up onto the porch, we are always welcomed by the sound of Granny Vi playing the piano. A drawer full of surprises! Cooking: Cooking at the River House is always fun because the house is loaded with the history of our California pioneer ancestors. 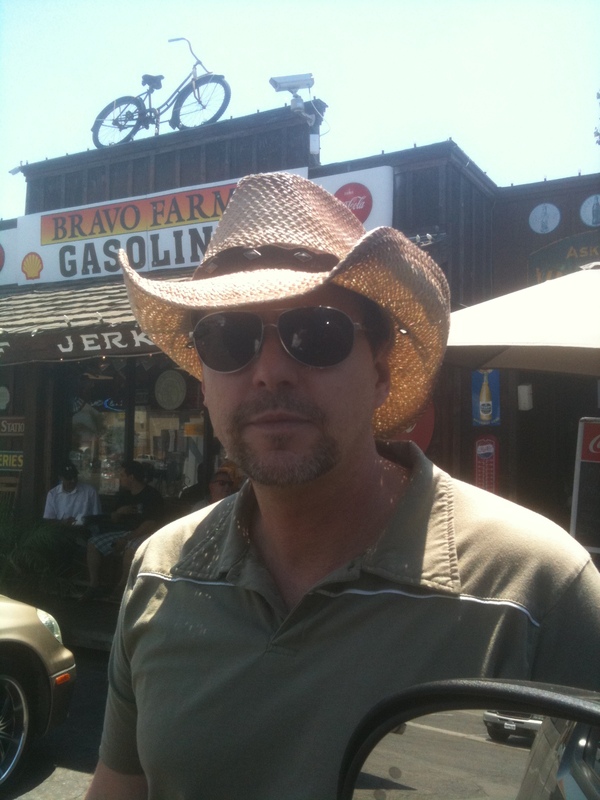 It is where our friends and family meet throughout the year, coming in from San Francisco, Carmel and L.A. The house is set up with enough pots, pans, plates and utensils to easily feed a crowd of thirty. Somehow, the pantry is kept stocked and there’s an extra refrigerator and freezer in the back next to the fish-cleaning sink. 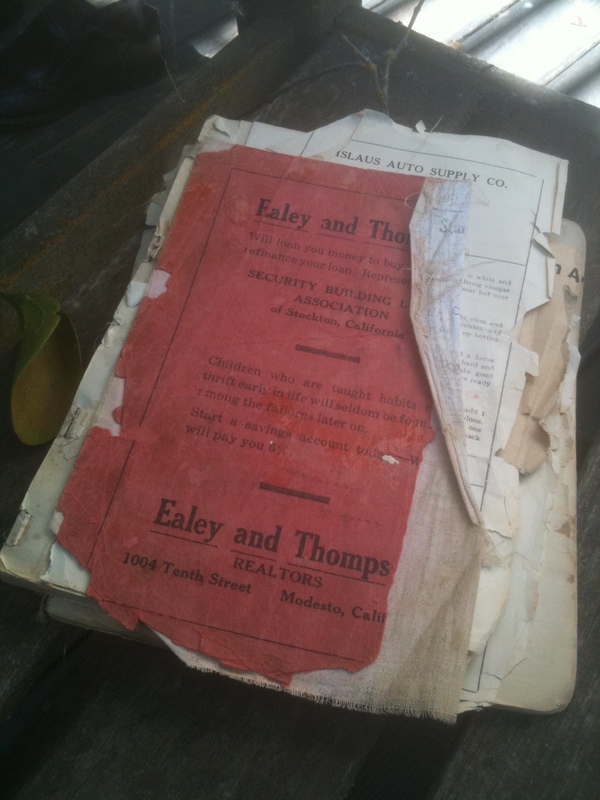 Best of all, Granny Vi has preserved a wonderful collection of heritage recipes recorded by our grandmothers. The cake: The basic recipe for this rolled cake comes straight from great-grandmother’s precious (and curious) tattered cookbook. Sarah Grayston Halverson would have baked her jelly roll on a special occasion for her husband, John, and their 7 children. She also likely baked it to take in the wagon to a potluck dance at the local lodge. On a VERY special occasion she might even have baked it for one of the ranch hands. She would alternate using fresh jellies and jams for the center filling in addition to fresh fruit from the family fields. Can you say Jelly Roll without smiling on the inside? And could you leave out the jelly, please, and replace it with sweetened fresh fruits and an elegant creamy filling? Okay. Here goes — with a recipe that takes vintage cake baking to an extended journey, both figuratively and literally. Warning: Vintage slow cooking results in a spiral slice of decadence…oh yeah! Take your wrist watch off and set aside time for a real cooking journey. Hopefully, you’ll draw your family and friends into the story you create with the making of this cake from days gone by. With a few modern adaptations, this simple “prairie roll” becomes a French Roulade to serve to a dozen business clients, friends or family in elegant vintage style. Even if your cherries are dark and sweet enough for snacking, they will need to be slowly and lightly sweetened in an overnight sweet poaching liquid for this cake. Just put pricked and de-stemmed cherries to a quick boil, stir once and turn off the heat. Cover them on the counter while you get some rest for baking up a storm the next day. Working alternate stove (that hasn’t been used in 50 years). A buttercream spread is standard roulade fair — but this old-fashioned version with French meringue buttercream – uses a cooked yolk custard AND a cooked meringue that makes it even more elegant (and decadent). We also added the whipped cream filling to make it lighter, believe it or not. This allows you to use less of the rich French meringue — giving it a silky and lighter sweetness. Each spiral slice is topped with a few brandied cherries. This hint of spiked cherries is prepared with just a tablespoon of Kirsch in a reserved cup of poached cherries to give it a slight kick. THEN, a teaspoon of the Cherry Chantilly goes on top of each slice with the tiniest drizzle of dark cherry syrup for accent. Now, if you want to ratchet up the country charm, you’ll serve each slice in a bowl, instead of in a dessert plate. And you’ll dribble a silver tablespoon of unsweetened heavy cream around the inner edge of each bowl…just enough to moisten the outer edges of the cake with a touch of fresh cream. This is called, “cake cream” in our part of the country. The cream is used without sweetening because the edges of the cake sweeten the cream. The cream also softens the cake, so add this at the table moments before eating. To be prepared the night before cake preparation. Tip: Do not remove pits at this stage to ensure firm and fresh results. Lightly prick each cherry a few of times with the tip-only of a small, sharp knife (or other pricking tool) without damaging them on the whole. Tip: Sit down with your friends or turn on your favorite Pandora music during this step. 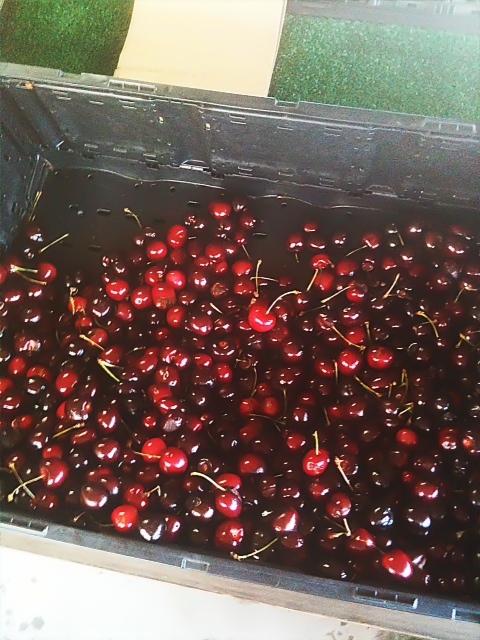 Special care is required to be certain each cherry is de-stemmed and looking gorgeous. Bring to a boil, stir once, remove from heat, cover and let sit overnight for at least 12 hours. Tip: Save the leftover cherry juice for recipe syrup discussed below and use the rest for pancake cherry syrup or homemade cherry jelly. Set rack in center of oven and preheat oven to 350. Prepare a jelly roll pan or cookie sheet by buttering the bottom of the pan (although, you will see from the photos that we made do with an unlevel, grooved broiling pan). Cut parchment paper or wax paper to fit entire pan with extra over the edge. Butter the top of the paper and set aside. Tip: You can use a whole cube of butter, unwrapped only at the edge, pressing down hard on pan and paper so you use only what you need. Cut a fresh lemon in half and squeeze half of it to achieve 1 t lemon juice, straining seeds as needed, set aside. Not fluffy enough yet…but keep beating – you’ll get there! Fold the dry ingredients into the egg mixture until fully incorporated. Cake is done when is lightly golden and tester comes out clean. Lift or slide cake from pan by grasping the paper edges that extend along the edges of the cake. Gently flip the cake onto the sugared towel and remove the paper from the cake. Roll up the cake, gently pushing the longest edge into a roll, rolling the sugared towel right up with the cake. Wrap the cake (towel and all) with plastic wrap and refrigerate for about 30 minutes while you prepare the frosting, the Chantilly cream and the cherry syrup. Tip: Use a candy thermometer since we are cooking the yolks with this hot syrup. Too much for this recipe — so the rest will be homemade cherry jelly. Very slowly, drizzle the 238-degree syrup into the bowl of whipped egg yolks and beat for 2 minutes to cool to room temperature. Tip: If you beat in the butter when the yolks are still hot from the sugar sauce, the butter will liquify (though you can chill this back and work with it again if this happens). Very slowly, drizzle the 238-degree syrup into the bowl of whipped egg whites as you beat on low for 2 minutes to cool to combine and bring to room temperature. Beat for about 3 to 5 minutes until stiff peaks form. Remove yolk custard from refrigerator and fold white meringue into the yolk mixture. Refrigerate for a minimum of 30 minutes before using as filling for the cake. Tip: This will be used as an additional layer inside the cake and also for the dollop on top of each slice…so don’t use it all on the cake. Remove from heat and stir for a few minutes to cool, set aside. Tip: Add 1 t of cream of tartar if thickening is required. Reserve the balance of the Chantilly cream for a dollop on each slice of the cake. Use the cherries halved (as shown) or, even better, carefully dice them with a sharp knife to hold their natural shapes. Remove refrigerated rolled cake that is wrapped in towel. Gently unfurl the cake to a crescent moon or “C” shape and spread it with a layer of Cherry French Buttercream. Tip: Cake will stay somewhat rolled (and that’s a good thing because we don’t want it to crack when it is rolled with the filling) so just do your best to layer it even though it is not flat. Top the layer of buttercream with a layer of Cherry Chantilly Cream. Top the layer of Cherry Chantilly Cream with halved or quartered prepared cherries. 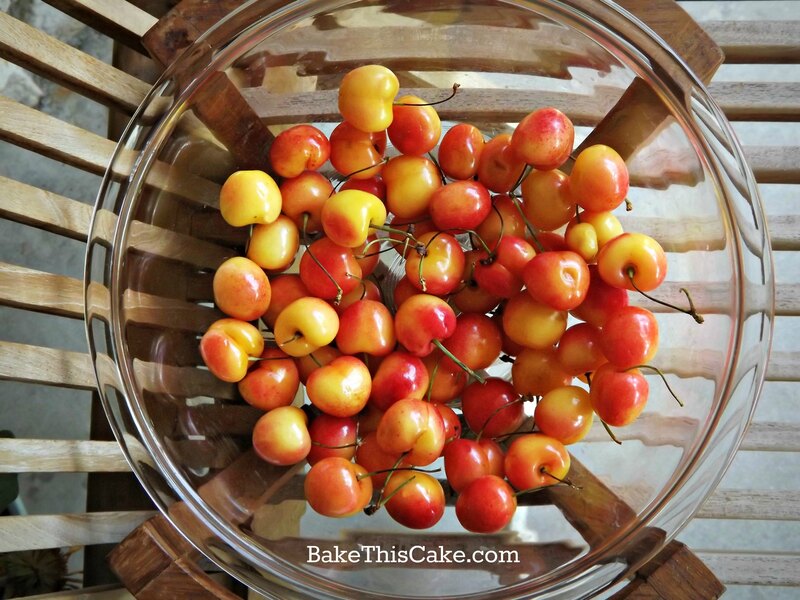 Tip: Photos show halved cherries but you may want to quarter the cherries…and that might be a better way to go to get a smoother look to your cake. Roll cake with fillings intact. Wrap with plastic wrap and refrigerate until serving time. Tip: An hour of refrigeration time would be great. Plate the cake on a large platter and drizzle some cherry syrup around the edges of the cake and decorate with a few cherries. Slice and serve each slice with a dollop of Chantilly cream, a few brandied cherries and a very small drizzle of cherry syrup. Optional country charm: Serve the slices tableside in a bowl with a tablespoon of unsweetened cream (half and half) spooned around the outer edge of the cake slice. And thank you for all your amazing feedback! Here’s hoping that your guests will be transformed to a summertime where tender care in home baking lights up the table with wonderful food and conversation. This looks like a good swiss roll. Can you show me a good marron glace’? You’re right, our vintage jelly roll cake is quite similar to a swiss roll. Thanks for checking out my cake blog!